I was asked by Jemima Kiss of the Guardian what was in my tech bag. So we recorded a chat for the Guardian Tech Weekly Podcast. <– It’s a great weekly installment and well worth subscribing to. Obviously the gear I use for digital storymaking is constantly evolving and what I use this week may not be what I have or need the next. 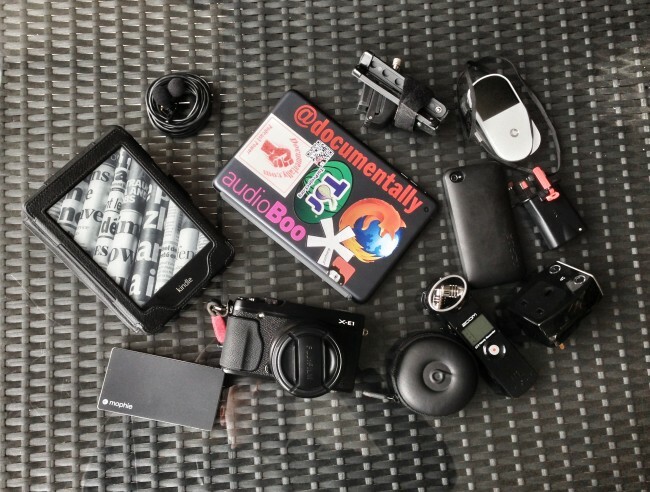 My kit should enable me to create, curate and share multimedia while mobile. So I need a capture device, an editing device and a data connection in order to share. On top of this, I need a battery or chargers so I can work remotely for longer. Ultimately a smartphone in a powered case will do, but I like to have gear backups and where possible to have the best kit to capture the highest quality visuals and audio. Ready for any environment. Great stereo audio and high resolution images in low light are still hard to achieve on a smartphone. Particularly when like me, you have found yourself wandering down the Apple path. With capture, share and power in mind there are a million gear combinations possible. For me this combination changes job to job, week to week as kit wears out and is replaced, or if new technology comes along enabling a huge leap in my ability to capture and curate content, power tech or connect to the internet. More than a few people have asked me if I can list the gear I talk about in the podcast so here it is. Kindle Paperwhite Not normally in my storymaking kit list but I save my online research via instapaper to the kindle for more focused reading. Giant Squid Audio Lab Stereo Podcasting mics Amazing mics with a thousand uses. I normally plug them into the Zoom H1 and monitor with the headphones. I am able to edit the audio on the iPad mini and email into Audioboo. Ipad Mini 64gig WiFi For writing, video blogging, editing, curating and in between.. email and gaming. Small UltraPod Had this for a while. A very lightweight phone and camera tripod. I use it with the Nokia DT-22 Phone Clamp which is hard to get hold of now. These are good too. <– Just the clamp not the tripod. Vodafone Mifi This enables me to connect five devices to the web via a pay-as-you-go sim card. iPhone5 There are other smartphones out there. My current workflow and app use stems from the fact I’ve been an iPhone user for ages. Looking forward to seeing if I can make the switch to Android though. I need more freedom in my operating system. ThinCharger 2100ma This is great for pocketing or slipping into a tight place in a bag. As it folds you don’t get any metal prongs damaging your bag or tech. It also delivers 2.1amps for fast charging your devices. Mophie Powerstation Duo I am a big fan of Powertraveller’s battery offerings but Mophie sent this review unit to test. It seems to work well at charging two devices simultaneously but not my iPhone5. Which effectively makes it useless to me. It has been sat in my bag powering my Mifi fine but when I really needed it for my phone it sat there clicking and I had to find a mains socket. It may be a faulty prototype. FujiFilm X-E1 When I want quality images in low light or to shoot a video blog with great audio (it has mic-in), this is my go to pro camera at the moment. It is a delight to use and has a suite of amazing lenses available should you take your photography seriously but not want to lug an SLR around. Zoom H1 I was using the Zoom H2n until Andre Louis suggested I try the smaller H1 because although it’s hard to handhold quietly, it’s pre-amps are amazing. He was right. I now use it with an external mic and it takes up little space. Masterplug USB and Mains Charger SRGAUSBPB-MP This has travelled with me all over the world. It’s a simple device that ensures I can charge all my devices from one plug socket. Both the USB ports are 2.1amps. Great for long train rides where you may want to charge a laptop, mifi and a phone or tablet from one mains socket. Any more devices and you still have the USB ports on your laptop. When relevant, I have used Amazon affiliate links above in case you find yourself wanting to expand your personal blogging kit. You will not pay any more by clicking on the link but if you make a purchase I’ll be eligible to a small commission I can then spend with Amazon. Please buy responsibly. Ask yourself if you really need what it is you are lusting after. I hate to see tech sitting unused in a draw. Pass it on and enable others where possible. Here is the gear listed above tagged in FLickr. I am often found reviewing gear so please subscribe to this blog If you don’t want to miss my thoughts. And I’m @Documentally on twitter and app.net should you want to ask me anything about the tech I’ve listed. Ideally It would be great if you could leave a comment telling me your Storymaking tech findings and questions. Thanks for the comment. I had borked the post but luckily @RichardMackney found the erroneous code and fixed it. Of course this is just the hardware being listed. Let’s not forget the apps and the people in your network. The apps change regularly. Your network may not. I find myself constantly being helped out of a tight spot by people like @RichardMackney and @MCFontaine. Two of the finest people I know and masters of their art. No matter how much I thank them I still feel indebted to their kindness. Any particular apps you use regularly for audio and video editing on the iPad Mini? It’s more the range of random apps enabling tracking, remote operation and secure coms that i liki. I will probably have to keep both. I guess the only unsolved mystery would be… what bag do you use to carry all of this around?! Great post and interview on the podcast, really enjoyed it and picked up a couple of good tips. I love to take a peek inside your kit bag! You mention that you often use the Ipad mini for audio editing and then upload to Audioboo, what software on the Ipad do you use for this? Hi, it’s not something I do a lot of. I have the capability to record I to GarageBand and then email the audio into AudioBoo. Useful and some new ones here for me. What about file transfers when the connections are funky? A ubiquitous connection can certainly be hard to maintain. I tend to have a mifi backup where possible. Dropping a mifi by a window or on a roof can get you a better data connection. In isolated locations i’ve also attached a mifi to a solar panel and stuck it up a tree or on a pole. There have only been a few occasions where I have had to hunt for public wifi in order to upload data. MiFi in a tree connected to a solar panel–I’m loving this. Honestly in my world, its either their or you go find it, not make it.